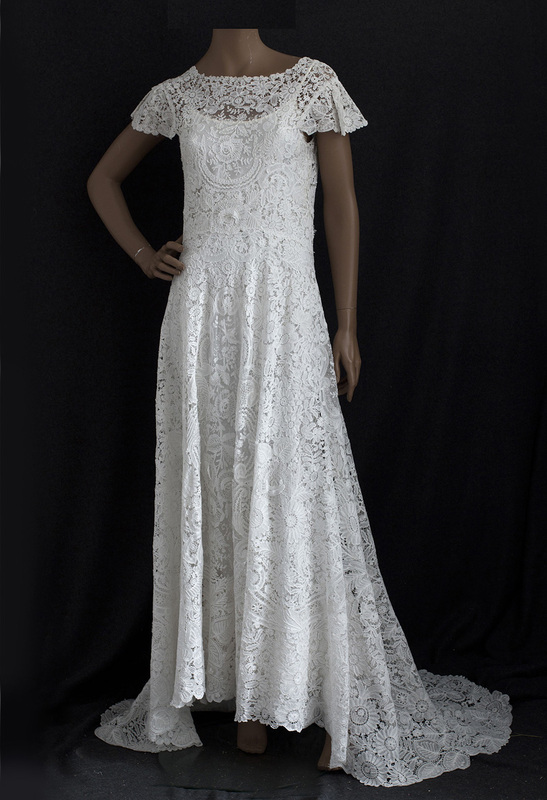 This important heirloom lace dress has panels of Point de Gaze needlepoint lace surrounded by Duchesse bobbin lace. A large piece of fine Brussels lace is itself a much sought after collectible. 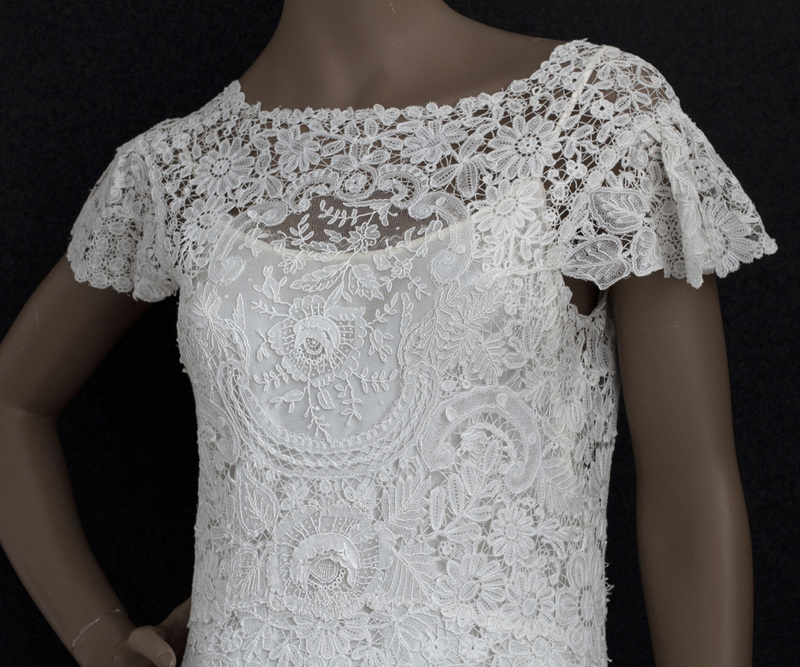 It is rare to find an entire dress made entirely from antique Brussels lace. 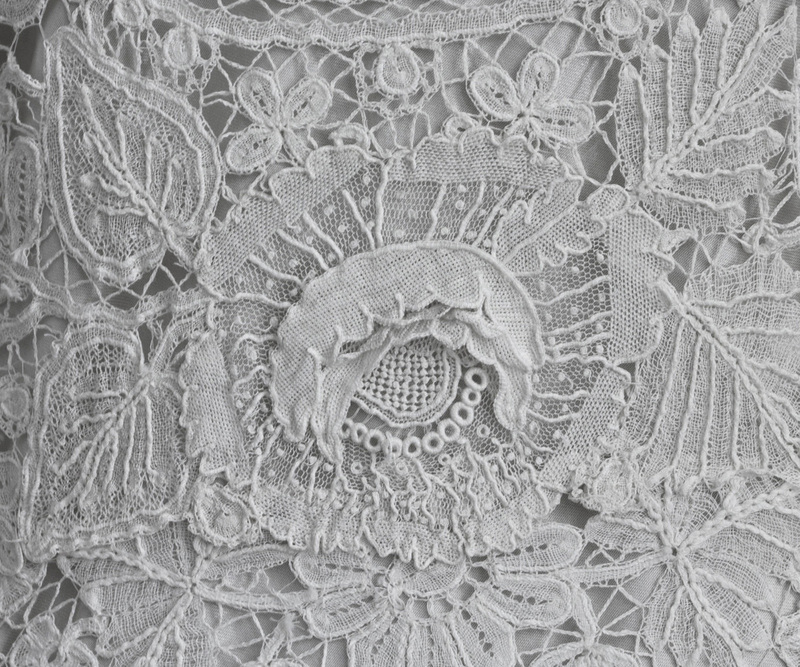 Celebrated for its delicacy and beauty, Brussels lace was first produced in the 15th century. Since it was created out of the finest spun thread, it could not be made by machine. Nor could it be bought outside of Belgium; hence the exorbitant cost of handmade Brussels lace. After WWI, production of Brussels lace virtually ended. The tradition is kept alive in Belgium today only as a popular craft. During the 19th century, Brussels lace was considered a costly collectible, often used for display in the home. We are in the debt of the lace connoisseurs who preserved the small extant stock of handmade Brussels lace. This exceptional dress came from a New England estate. 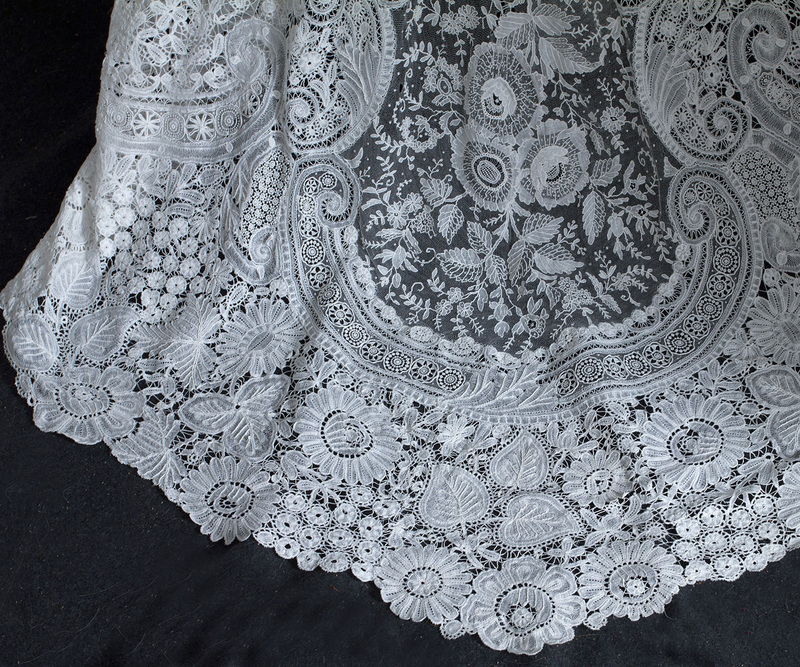 The antique Brussels lace is from the late 19th century. The dress itself was restyled at a later date. 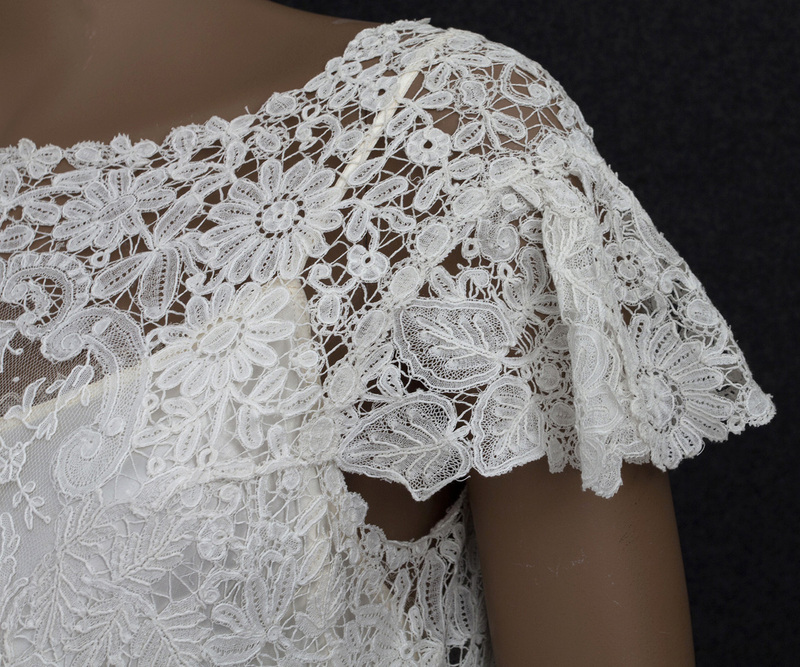 Because of the aesthetic and monetary value of Brussels lace, it was normally handed down through several generations, whether as separate pieces or as part of an altered garment. 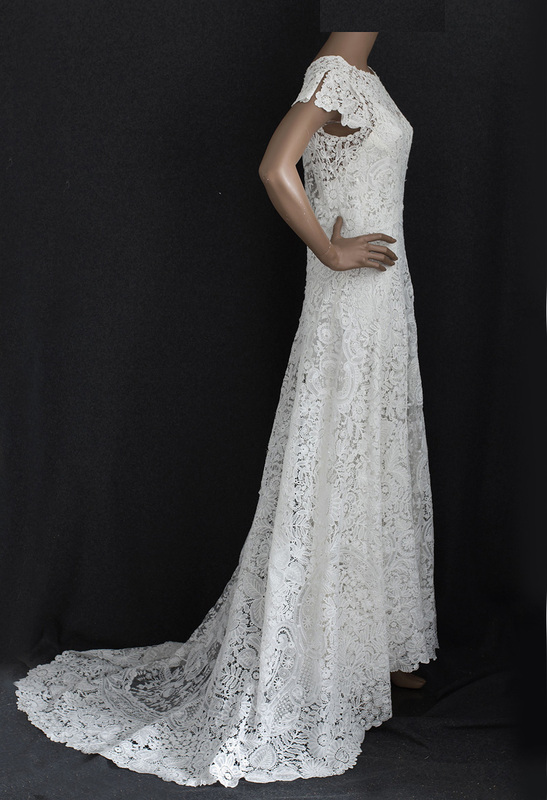 In its current incarnation, our wedding dress has the fluid ease of a 1930s evening dress. There is no need to be corseted or constricted in this wearable work of art, so comfortable and easy to wear. The lace style is also very au courant. Ralph Lauren had a big hit with his vintage style lace and crocheted dresses in his 2011 collection. The understated style of the dress showcases the lacemaker's art. 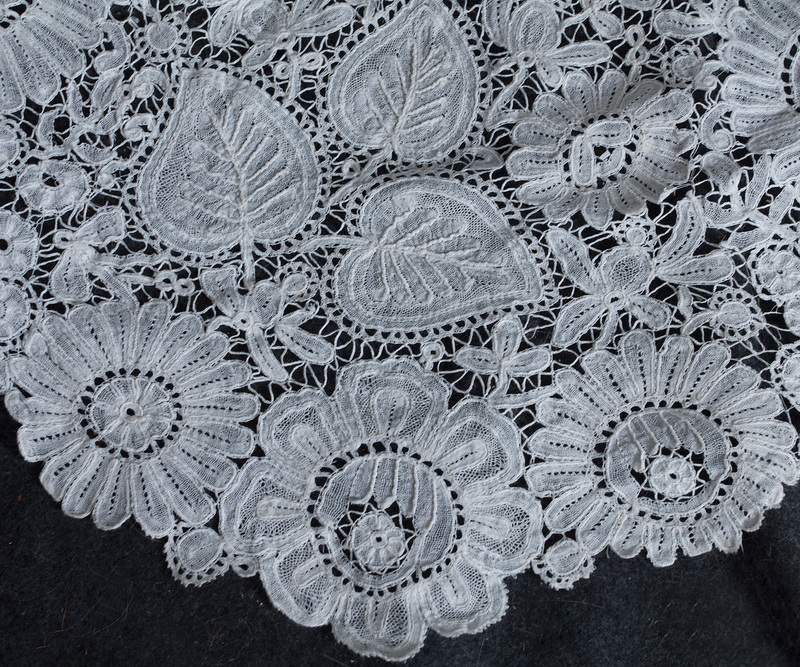 Duchesse bobbin lace is used for the daisies and leaves created with amazing verisimilitude. The lacemaker's pièce de résistance is the virtuosic use of Point de Gaze needlepoint lace for the glorious roses executed with a gossamer delicacy and tender refinement. The waistline seam dips to below the waist in back, drawing attention to the graceful train. The partial sleeves are open to the shoulder. The dress has a small center-back opening that closes with tiny hooks and snaps. I did not need the opening to dress the mannequin. The dress has been paired with an ivory satin, bias-cut slip from the 1930s. 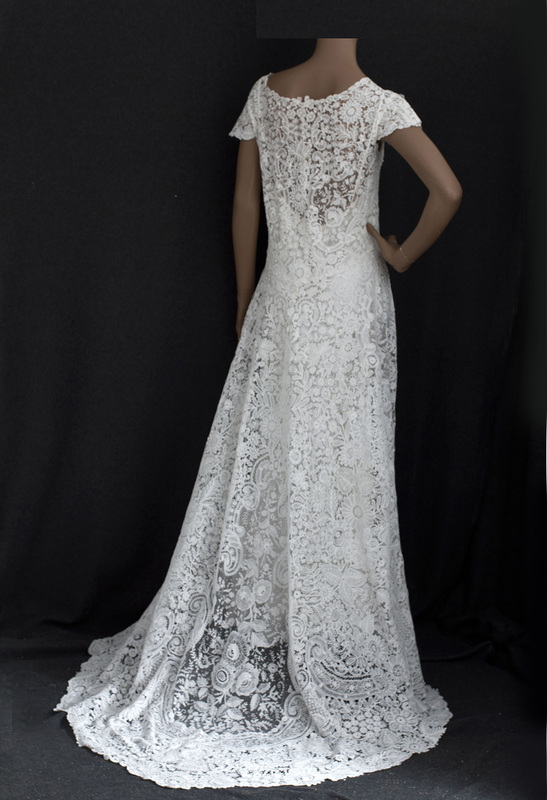 Our dress brings to mind the dress worn by Kate Middleton at her 4/2011 wedding to Prince William. Both dresses were created entirely from handmade lace: 19th century Brussels lace in our dress; and modern French Chantilly lace and English Cluny lace in the Royal dress. Kate Middleton's dress cost $390,000 vs. $6,900 for our dress. Here are the main reasons for the much higher price for the Royal dress. 1) It was made by Sarah Burton for Alexander McQueen's fashion house. 2) It was created for the most important Royal wedding since that of Grace Kelly in 1956. Her dress was also of Brussels lace. The relationship of price to value depends on a few key factors discussed in Collecting Vintage Clothing. Price may either be far above or far below value. For our impeccable wedding dress, price is far below value. At an 11/2013 antique clothing auction, a similar but deconstructed 1890s Point de Gaze dress sold for $25,000. There inheres in our noble wedding dress an uncommon beauty both historic and classic. 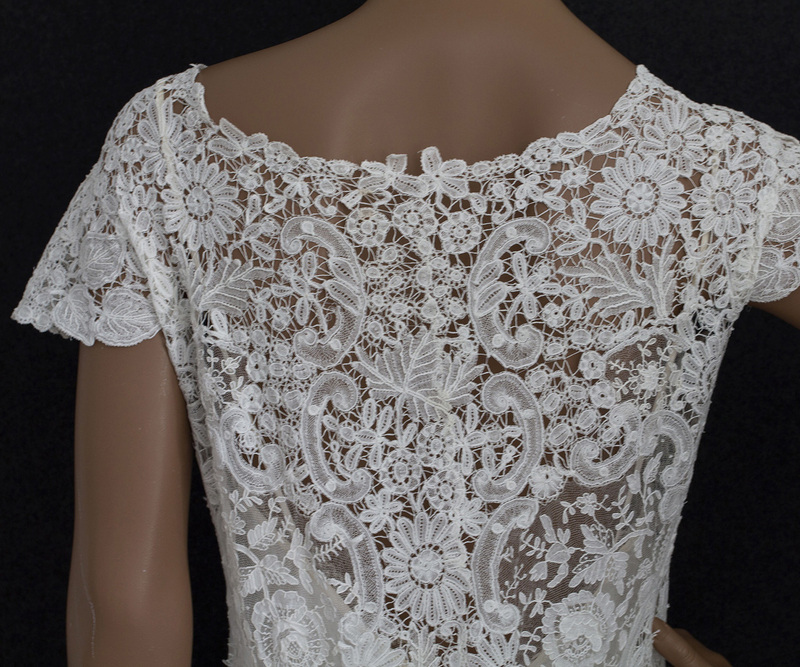 As she walks down the aisle in this antique lace treasure, the dazzling bride will personify a poem of elegant refinement—for the guests on that day; and for the bridegroom forevermore. The condition is excellent and wearable. The dress measures: 38" bust, 34" waist, 48" hip, and 57" from the shoulder to the front hem. The slip measures: 36"-38" bust, 34" waist, 40" hip, and 57" from the shoulder to the front hem.